Air-conditioned Van which can accommodate 10-12 adults and one driver. With luggage this van can accommodate up to 8 adults. The larger Deluxe Vans can accommodate up to 15 adults for trips and 10 with luggage. Professional van driver/tour guide. Driver would be available 10 hours per day. This includes both driving and waiting time. This will be a total of 10 hours and can be broken up during the day (i.e. 5 hours morning, 5 hours evening etc). Additional hours (overtime rate) should be negotiated directly with driver. Van can only be driven by van driver. 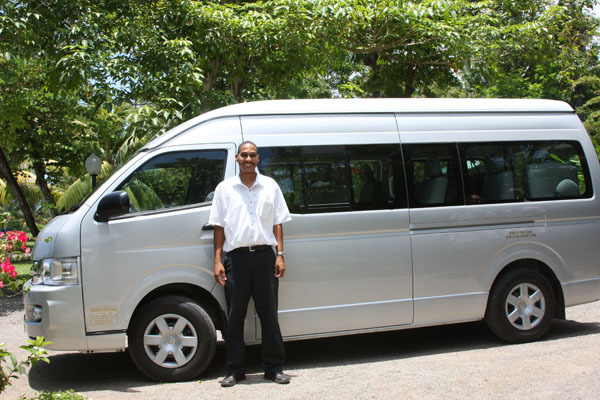 Unlimited Montego Bay airport transfers (one van only), local trips ( Ocho Rios/Runaway Bay/Discovery Bay) for Ocho Rios area based guests and Montego Bay area for Montego Bay guests and one long trip anywhere on the island (such as Negril, Kingston, Port Antonio) are provided with the weekly package. Additional long trips can be negotiated directly with your driver. Less than one week van package includes all local trips but no long trip. One tank of gas is provided. Clients are responsible for additional gas purchases. Tolls on the Kingston - Ocho Rios highway are not included. These tolls are approximately $50 USD roundtrip. Suggested 15% gratuity paid on last day at airport drop off. All Jamaican Taxes are included in rates.